Today my TOP853-programmer arrived from China. It’s a cheap EEPROM-programmer that I intend to use for programming EPROMs for my Drumtraks. At $40 it’s worth taking a chance, but I’ve heard others that have had great success with them. I bought it from “BuyInCoins” and the delivery time was less than three weeks to Sweden. The thing to be aware of is that the TOP853 doesn’t work with 64-bit operating systems. That’s actually not a problem since I have a virtual Windows XP-machine that I use for a lot of old skool stuff. 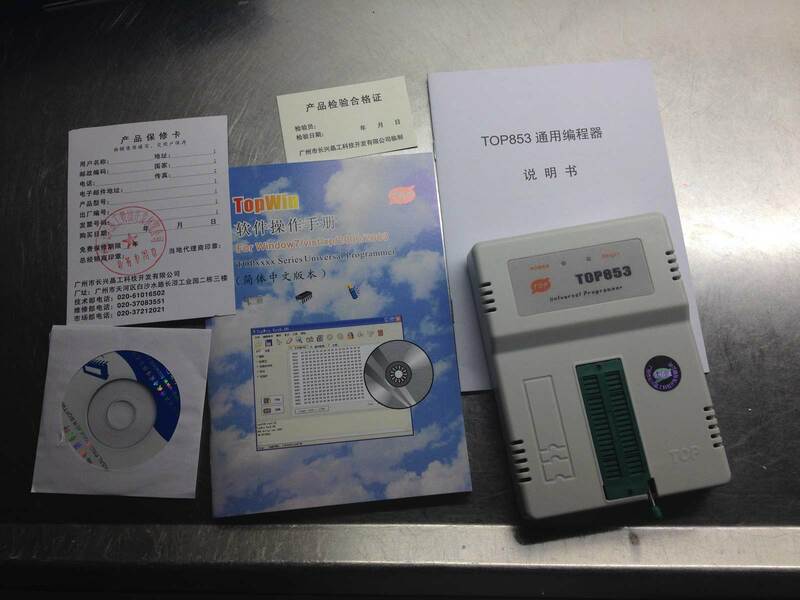 In the slight dented box was the TOP853, a USB cable, a small cd with drivers + software and lot of documentation in Chinese. 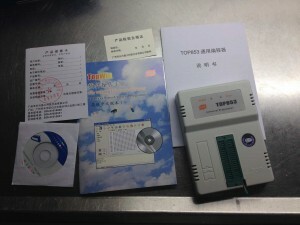 I ignored the cd and manuals and went directly to the TopWin download page (also in Chinese). The download of a few megabytes took about 10 minutes! I started the installation and chose English (should be Chinglish) and the installation started. After the installation I started the software which couldn’t find the TOP-programmer. I looked in the Device Manager and there was an exclamation mark on it, so I restarted XP. After the reboot the TopWin software found the TOP853 without any hassle. Having never done things like this before, I found the software very easy to understand. You start by selecting the correct chip by manufacturer, and if it’s not there, choose a generic profile with the same properties. Since I don’t have any empty EPROMs and my UV-eraser-box haven’t arrived yet, I could only test the reading capabilities. My Drumtraks was supplied with some extra chips with unknown origin. After tweaking the reading settings (since the particular chips weren’t in the manifacturer list) I managed to read all chips. The Drumtraks use 2764 EPROMS for all voices except the kick which is a 2732. I compared the contents with the all the EPROMs available on Electrongate, they will probably be added here. Paul who own Electrongate is a very nice guy by the way! Next step is to burn some Linn LM-1 EPROMs for the Drumtraks!